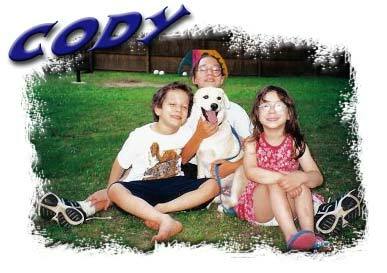 With TOTTSHR's help, little Cody found his way home from Virginia all the way to New Jersey, to the home of Anita and Herman in early August of 2001. "Here is a picture of Cody the first day we got him home after all of your generous time you took out to bring him to us and to help arrange his adoption. Tyler is on the left, Gabrielle is in the back, Victoria on the right, and Cody is in the middle. Cody is doing really well. We all love him to death. Thank you all!"